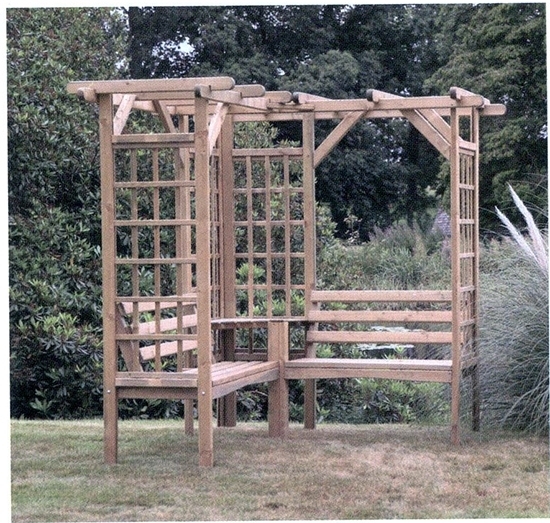 Elegant trellis near North Yorkshire can be found in our garden centre. Steam and Moorland Garden Centre has always kept a wide range of garden furniture, including decorative structures, such as beautiful garden treillage. Our premises are located in Pickering near North Yorkshire. Could your home and garden use a trellis to give your vines something to work on and make your garden look prettier? We look forward meeting you! When it is a matter of aesthetics, variety becomes a necessity for any garden centre. With our desire to satisfy all of our customers with varying tastes and ideas to decorate their gardens, we keep all kinds of treillage products in our inventory and on display at the Steam and Moorland Garden Centre. We have sophisticated alcove arbours that seat more than one person and have a storage box underneath. Our inventory for trellis near North Yorkshire includes arches of various designs with elegant latticework to guide your climbers. We also offer pergolas latticed on the back and top so you can guide your vines and make cool shade for yourself and your guests. The benefits of having a delicately latticed trellis in your garden are many. It gives you the opportunity to let your vines grow, producing elegant artworks full of colours and a completely natural look. We only keep the best items in our inventory. In our garden centre, you will come across an impressive variety of trellis structures made to give your garden the beauty it deserves. When you visit our premises, you can choose from our range of trellis products with varying prices and designs, depending on what you think will look lovely in your garden and suit the vines you have. Getting to our garden house is quite convenient for residents of North Yorkshire. All you have to do is drive through the A658 and A59 until you meet the A64. From there, you drive North. You will reach our gates half a mile short of Pickering to the right. If you cannot visit our display of trellis near North Yorkshire or if you live in other parts of the country, you can easily and securely order your favourite trellis via our online store. We have all the items in our inventory on display in the store. We deliver our products to every corner of the UK and in the EU. You can buy your favourite garden furniture and decorations on our online store. Visit our garden centre any day of the week or place your order online.